I've been thinking about making this one for a while, and finally got around to finding a night to try it out! 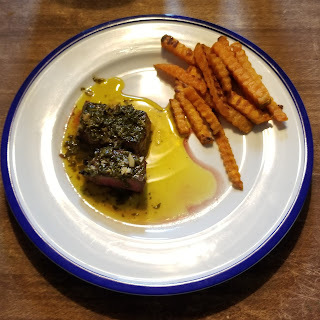 The chimichurri sauce is full of big flavors that compliment steak perfectly! This chimichurri is based off of Anthony Bourdain's version, with a few modifications. Combine all ingredients in a bowl and stir until combined. 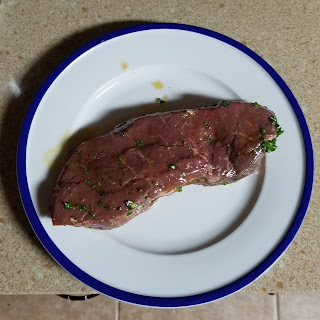 Marinate the top sirloin in a plastic storage bag for at least 1 hour. Then, it's time for the grill. I grilled this top sirloin using the reverse sear method. While the top sirloin was on the grill, I put the remaining marinade on the stove. Once it came to a simmer, I turned down the heat. Now, I had a sauce for my steak! I served this top sirloin along side some crinkle cut sweet potato fries!